We all love the taste of chocolate that simply melts in your mouth, that’s why this year at the Winter Fancy Food Show in San Francisco we teamed up with William Dean Chocolates. William Dean Chocolates are all pieces of artwork that are handcrafted! Plus, there are no preservatives in their chocolates! When we approached them about creating a chocolate specifically for us to hand out as samples, they told us about a special treat they create. This chocolate melt is something that is ONLY made for a friend as a favor. They started making these special chocolates when their friend approached them wanting a quick and easy way to give coconut oil to someone with Alzheimer’s. Needless to say, we not only fell in love with the chocolate, but with the story! We hope everyone who tried these amazing chocolates enjoyed them! If you haven’t stopped by yet be sure to visit booth #4747 before the show ends. 2. Melt the chocolate and coconut oil together either in a microwave safe bowl or on the stovetop. Add the peppermint extract and stir well. 3. Pour the melted mixture into a small cake pan and place it into the fridge, let set. 4. 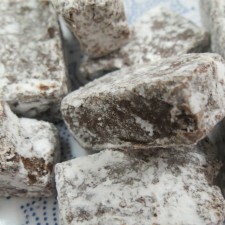 Once hardened cut into pieces and put them in a tupperware with the powdered sugar. Place the lid on the tupperware and shake until all of the chocolate pieces have a light coat of sugar on them. How do you sneak coconut oil into your diet? wait to browse more of your articles. Time to spend a bit of time on the web haha.